2015 was a banner year for mankind to be cruel to one another. I have been growing more cynical with the years, but it’s hard now to retain any faith in the wisdom and goodness of humanity. Abroad, terrorists are slaughtering hundreds in the name of a religion their so-called “beliefs” don’t resemble in the slightest. On the home front, politicians vying for the highest office in the land spew hatred, fear and humiliation in the pursuit of attention and power. It’s enough to make a nature girl weep. Trail time offer a respite from the cacophony. Walking along a peaceful lake or thunderous surf, watching the infinite variety of critters going about their daily lives… All serve to remind me that man is but one of the species sharing this planet. To the bufflehead ducks swimming by, I am of no consequence. Somehow that soothes my soul. But what in nature can restore my faith in the human species? Man’s need to create beauty reminds me there’s a flip side to the boorishness and hatred. 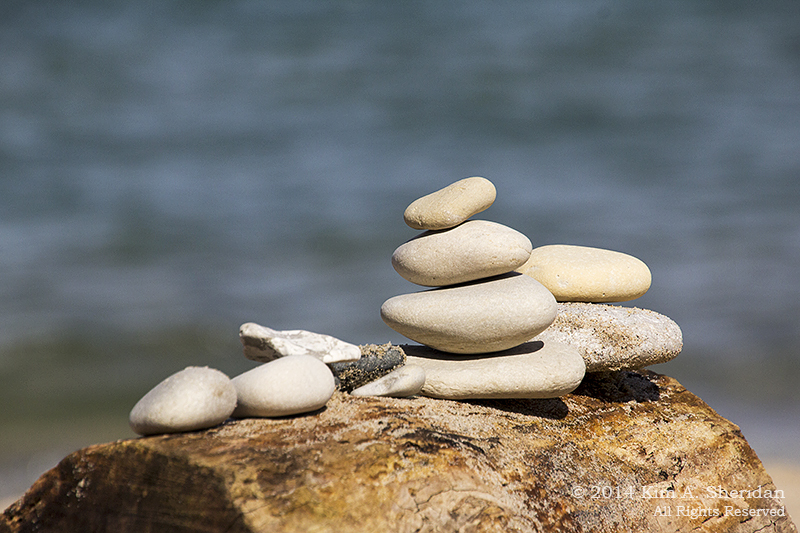 Even far from paint brushes and sculptor’s tools, the artistic hand of man can be found. 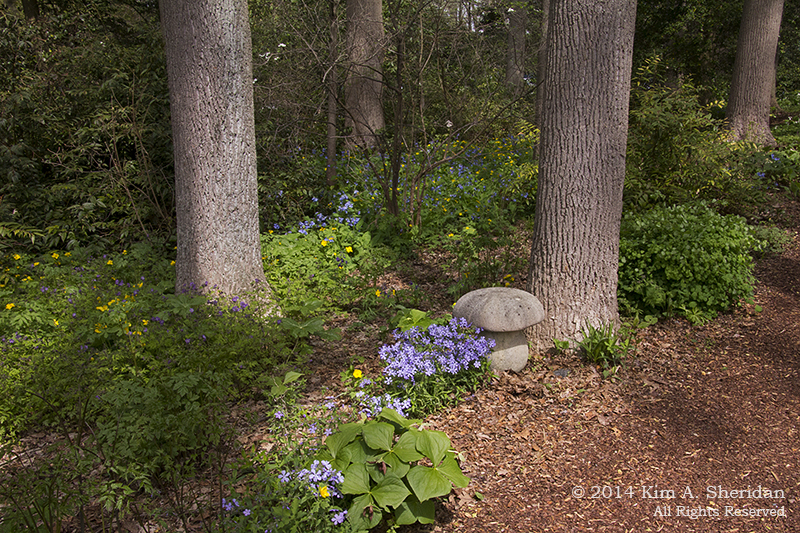 Sometimes it’s a small garden statue placed just so among the flowers in the woods. 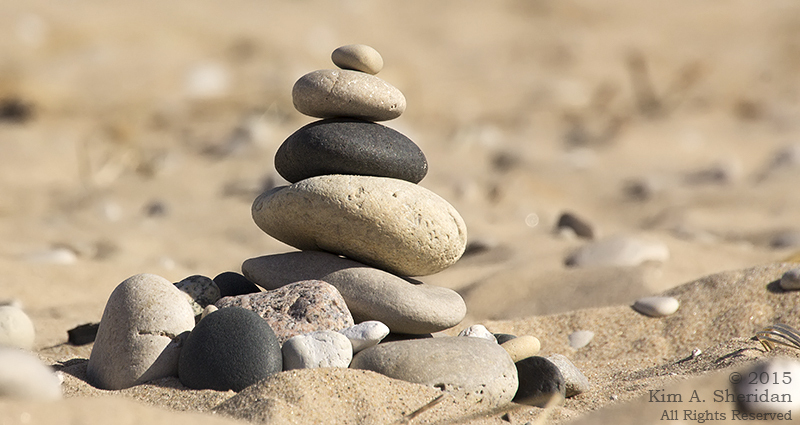 Sometimes on my meanderings, I come across cairns, these small stacks of stones. 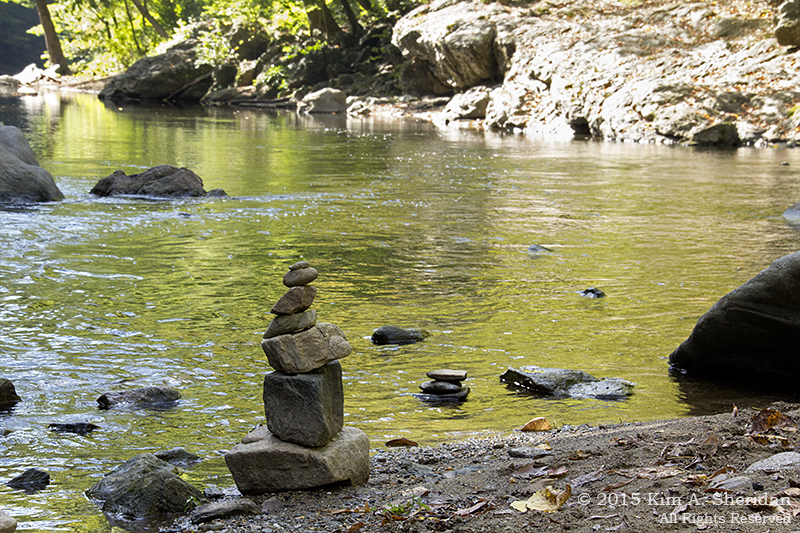 Cairns originally functioned as directional signals on trails, but have been raised to an art form by creative wanderers. 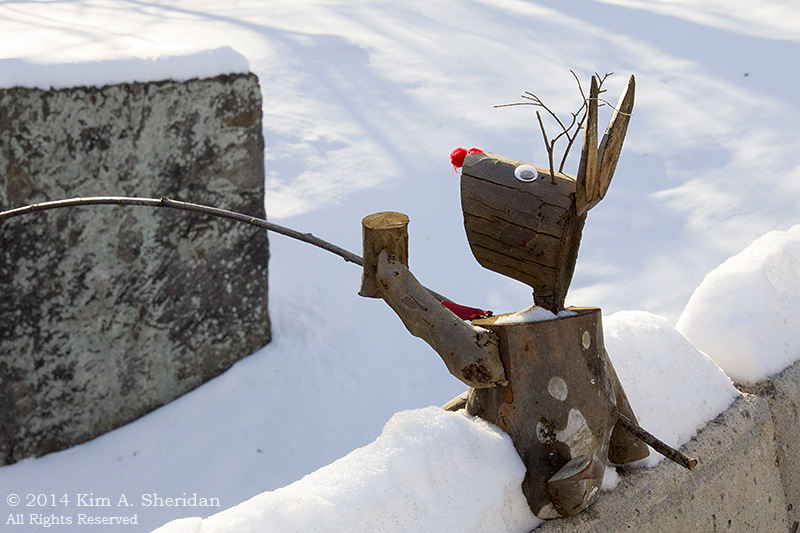 Once I came across a humorous figure perched on a bridge, placed there just for the amusement of others. And in its serendipity, I am reminded of our sense of community, our need to comfort and cheer one another. 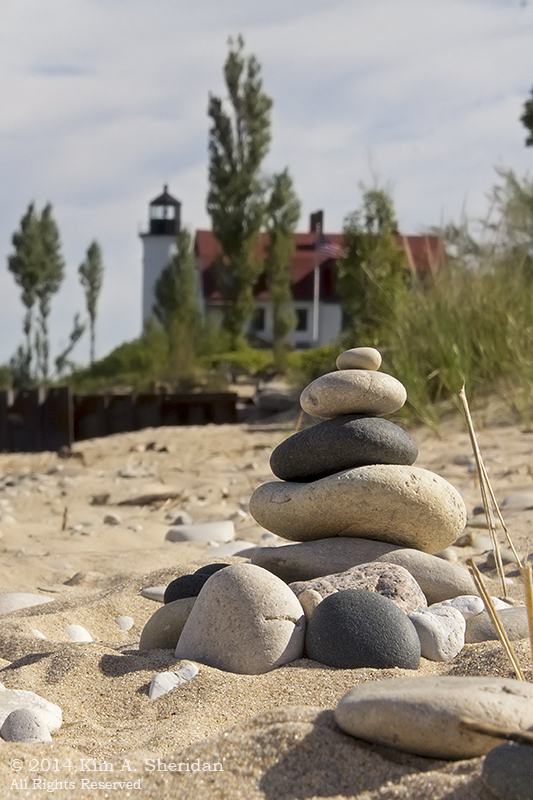 At Point Betsie in Michigan, the entire beach is covered with a wondrous variety of weatherworn cobble. Perfect for creating art. Seeing these works of trail art reminds me of humanity’s love for beauty, and gives me hope that our race may one day put behind us cruelty and hate. Lyrics to “Rhymes and Reasons” by John Denver. 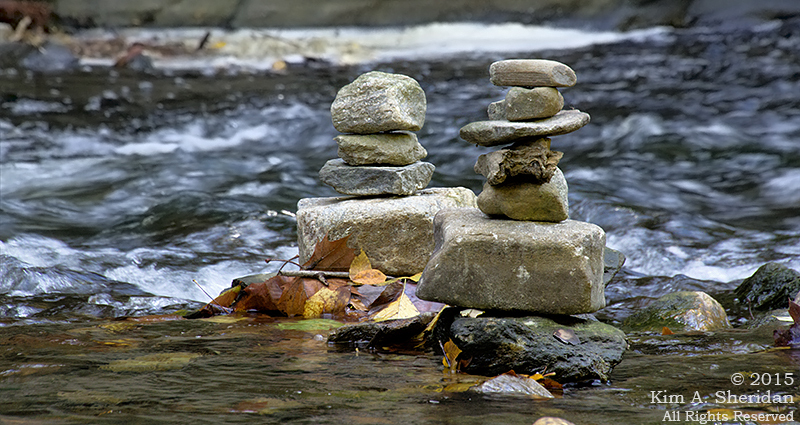 This entry was posted in On the Trail, The Sounding Board and tagged Michigan, Nature, Wissahickon by Kim. Bookmark the permalink.